You’re in for a real “tweet” when the City of Ormond Beach presents a free community event celebrating birds! 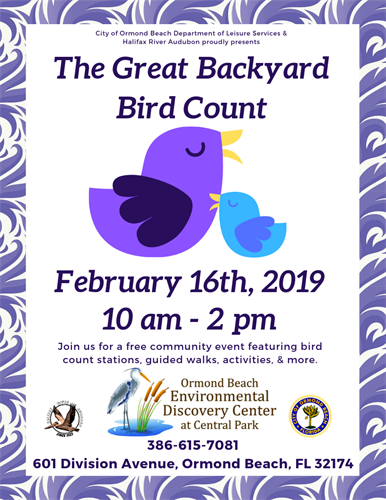 The Department of Leisure Services and Halifax River Audubon proudly present The Great Backyard Bird Count at the Environmental Discovery Center on Saturday, February 16th between 10 am and 2 pm. Halifax River Audubon will provide complimentary guided bird walks through Central Parks’ trails and official counting stations at Joyce Ebbets Observation Pier and the Environmental Discovery Center. At the EDC, enjoy family friendly bird-themed games on the lawn, crafts in the classroom, and tours inside the facility. Win prizes and learn more about our feathered friends! Free parking is available at the Environmental Discovery Center. Guests of all ages are invited to attend. For more information, call 386-615-7081. The Environmental Discovery Center is located at 601 Division Avenue in Ormond Beach, FL 32174.